The Art of Food – Food Glorious Food! Food Glorious Food! Where would we be without it. 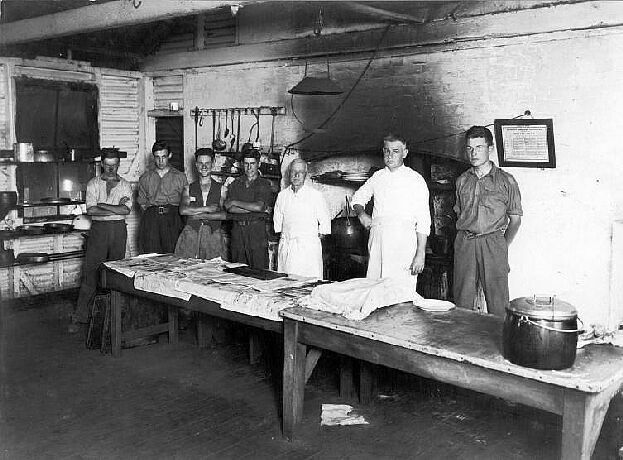 The production and consumption of food has always played an important role in the history of New South Wales. 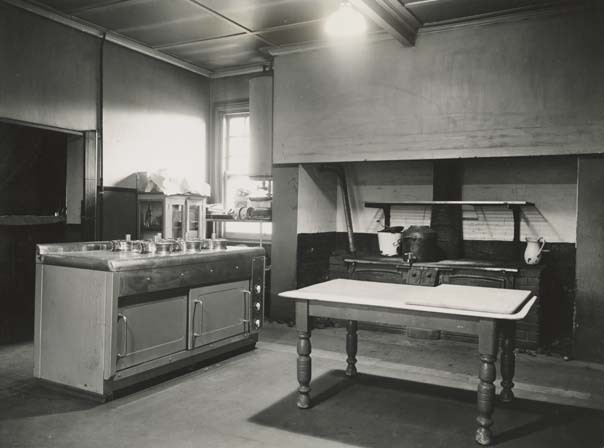 This gallery shows a selection of State archives that highlight what we have been eating in the home and on show. When the First Fleet arrived in 1788 it faced starvation in the first few years. Many of the convicts had no knowledge of farming techniques and the tools and seeds brought over from Enlgand proved to be unsuitable for Australian conditions. In December 1790 Governor Phillip was quick to herald the first successful harvest in the Colony of 25 bushels of barley. James Ruse and John Macarthur were among some of the early success stories of cultivating the land. Macarthur went on to lead the way in the establishment of the sheep industry, the Colony’s first export. These rations don’t seem much when you consider that many of these convicts were taking part in hard physical labour such as road gangs. Rationing for convicts continued until the 1840s. 1. 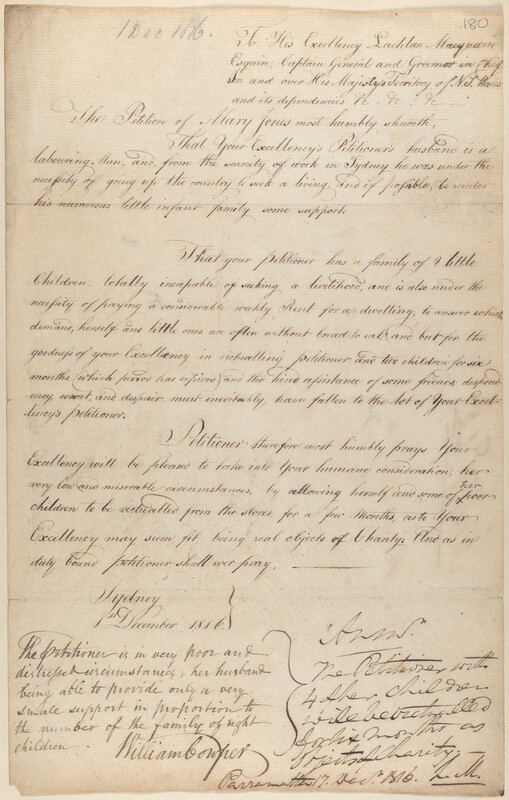 This is a petition to Governor Macquarie from Mary Jones and four of her eight children to be victualled from the Government Stores. There is a note at the bottom left hand side of the letter from William Cowper stating that Mary had eight children. 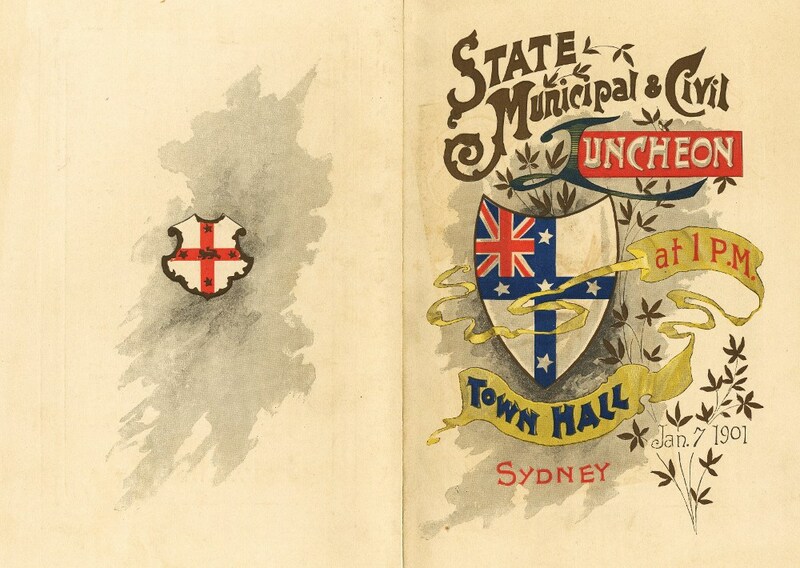 Mary's husband had left Sydney and gone "up the country to seek a living". Mary pleads for humane consideration of her "very low and miserable circumstances" that had left them "real objects of Charity". Mary and four of her children were victualled for six months. NRS 897 [4/1736, p.180, Reel 6046]. 2. This is a list of weekly ration supplies, dated 24 September, 1823. The columns across the top include fresh meat, Wheat, Wheat or Flour, Maize, Wheatmeal, Sugar, Tea and Spirits. 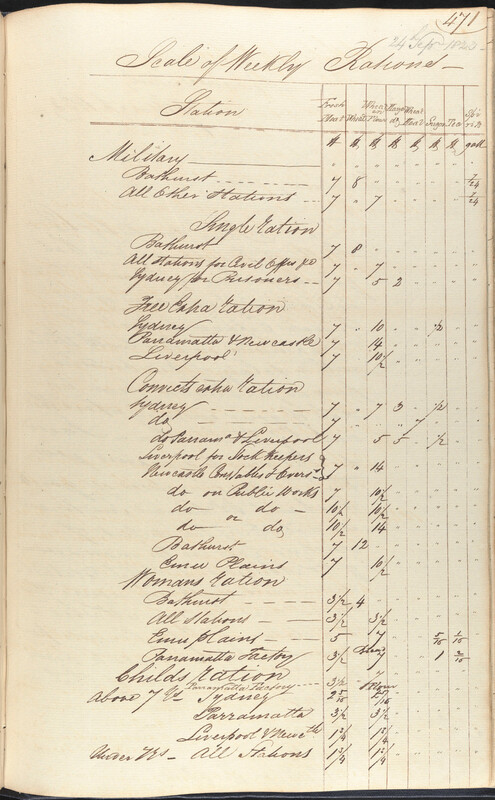 There are rations for military personnel, male and female convicts and children. The areas included are Newcastle, Sydney, Parramatta, Bathurst, Liverpool and Emu Plains. It is interesting to note that the female ration is about half that of the men and children receive a lot less. 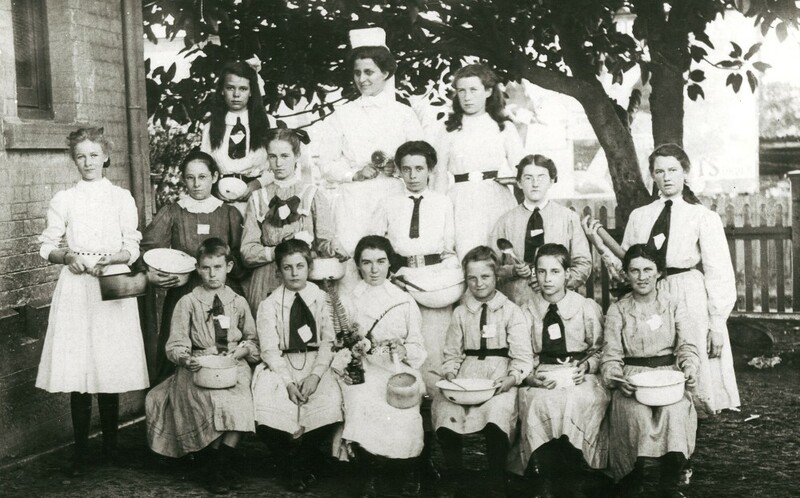 Those convicts working at Emu Plains (probably on the Government Farm) and the Parramatta [Female] Factory are allowed more rations due to the manual labour undertaken. NRS 938 [4/5783, p.471, Reel 6017]. 3. 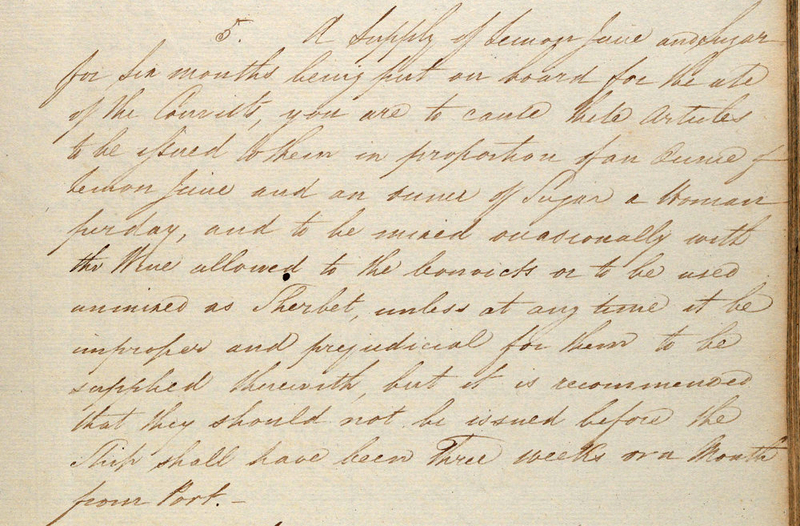 This is part of a letter of instructions sent to Peter Cunningham, the Surgeon and Superintendant on board the Grenada, from the Colonial Secretary's Office, dated 10 August 1824. The Grenada sailed from London on 2 October 1824 and arrived in Port Jackson on 23 January 1825. 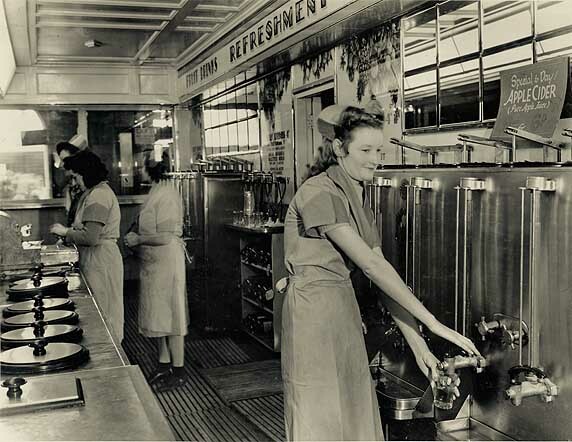 Section 5 states that lemon juice and sugar should be rationed to the female convicts once the voyage was three to four weeks from port. 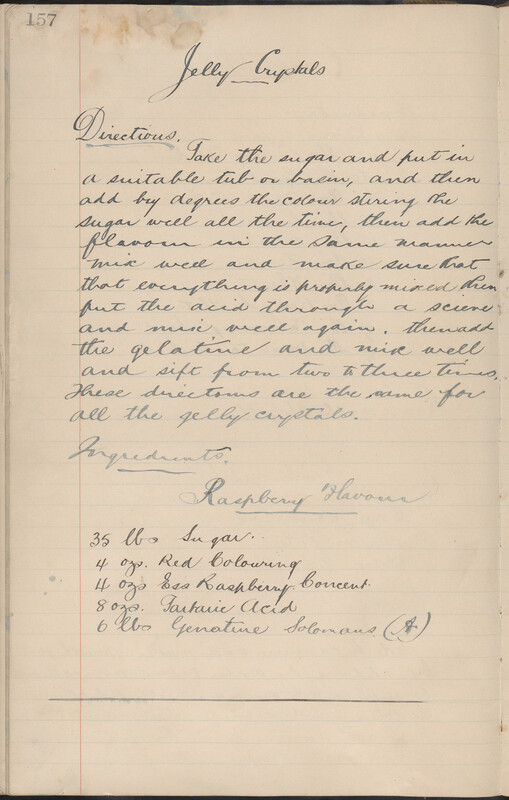 The ration was for one ounce of lemon juice and one ounce of suger per woman per day. It was allowed to be served with wine or as a sherbet. NRS 938 [4/5782, p.215, Reel 6017]. 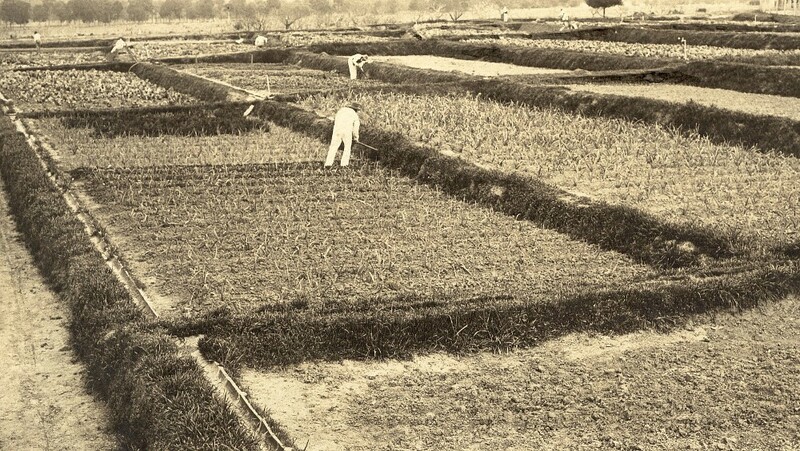 The farming industry and food culture expanded greatly from the 1850s onwards as more immigrants arrived in the Colony from all over the world. 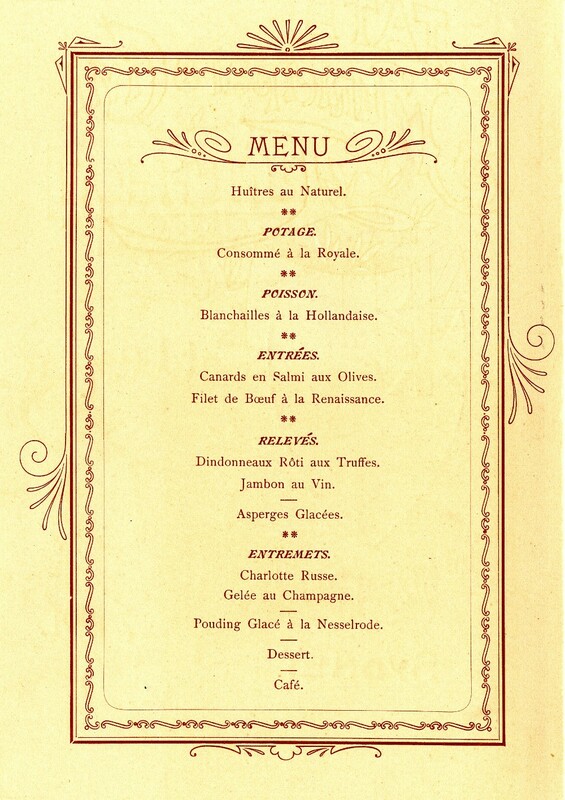 Many of the dinner and lucheon menus that have survived from the 1920s and 1930s though, have a decidely french or english feel. 1. 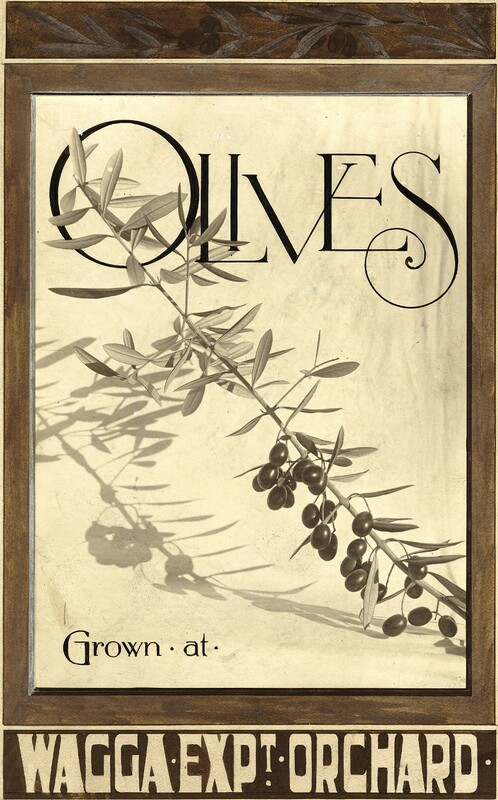 This label for olives is from the Wagga Wagga Experiment Orchard. NSW has a long history of government farms with the well-known Experiment Farm at Parramatta on the site of the first land grant to James Ruse and the oldest European homestead. Other well-known farms were at Toongabbie (1791-1801), Castle Hill (1801-10) and Emu Plains (1819-32). 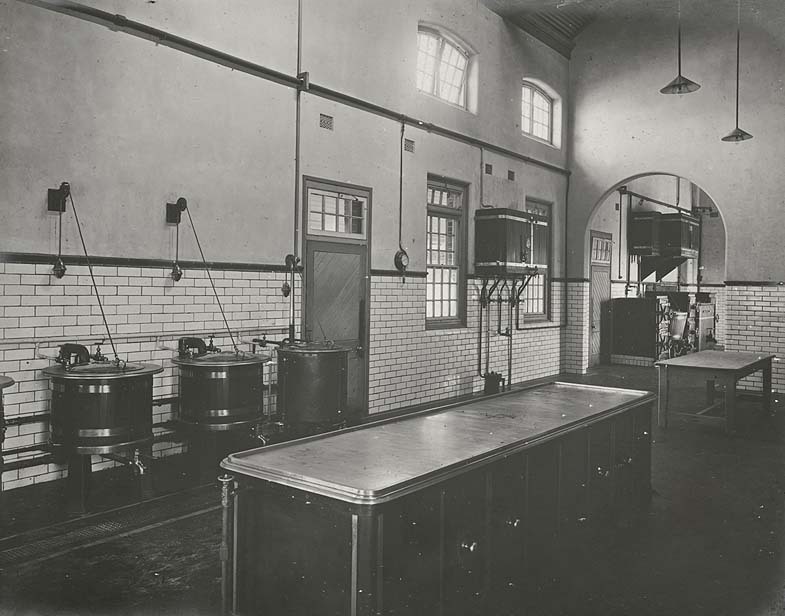 The Wagga Experiment Farm was established in 1892. NRS 211 [3/3505]. 2. 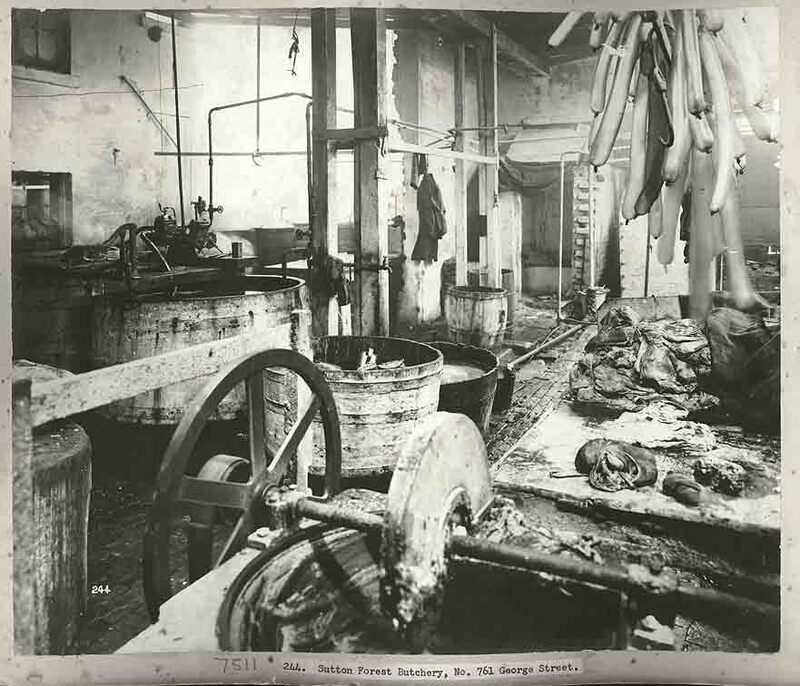 This illustration and photo is part of a series of illustrations that were published in the NSW Agricultural Gazette. 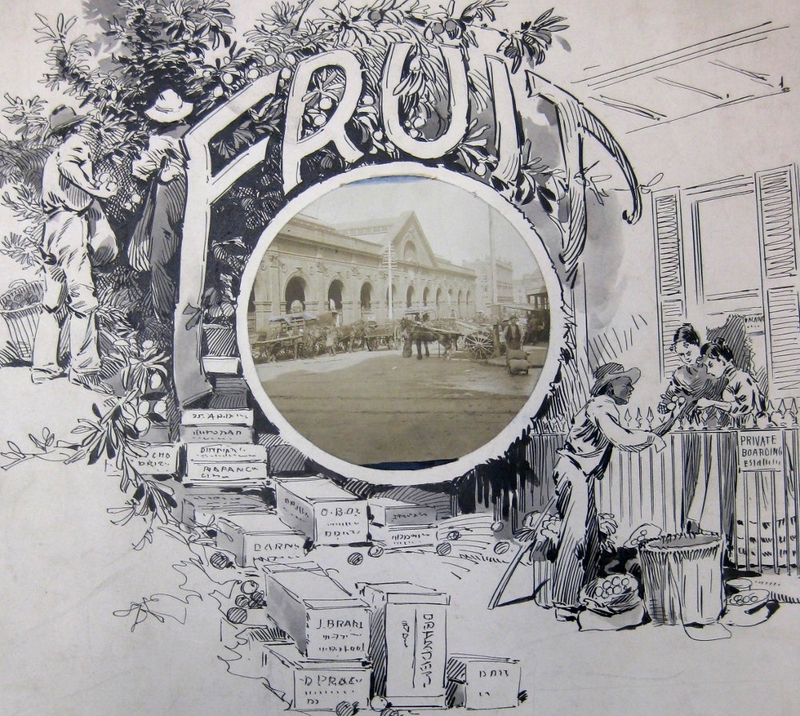 This illustration depicts the flow of fruit from where it was grown on the farm, sold at market (see photo in centre) and then onsold to the consumer, in this case a couple of women outside their home. NRS 211 [X873]. 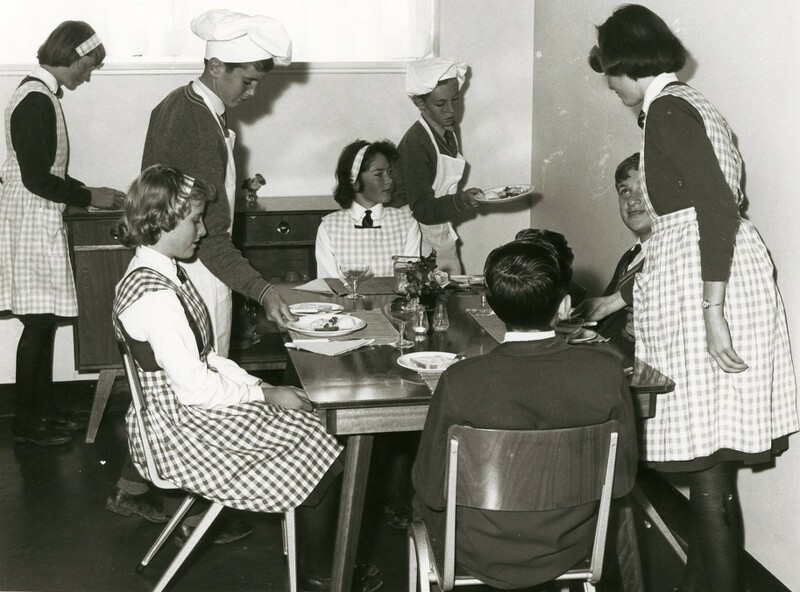 1.This excerpt from the NSW Educational Gazette provides an outline of the 21 lessons to be included in the Plain Cookery programmes in public schools. It covers the basics such as baking, roasting, stewing, salads, vegetables and preserving. NRS 3830 [20/12609 Bundle A]. 2. 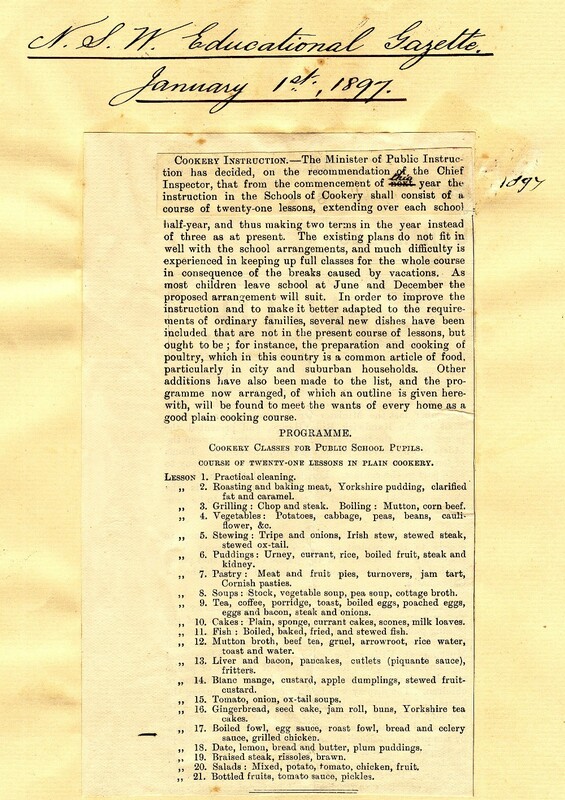 This is one page of several that outline the recipes to be used in the lessons for Cookery Instruction in Public Schools (see previous image for more details). 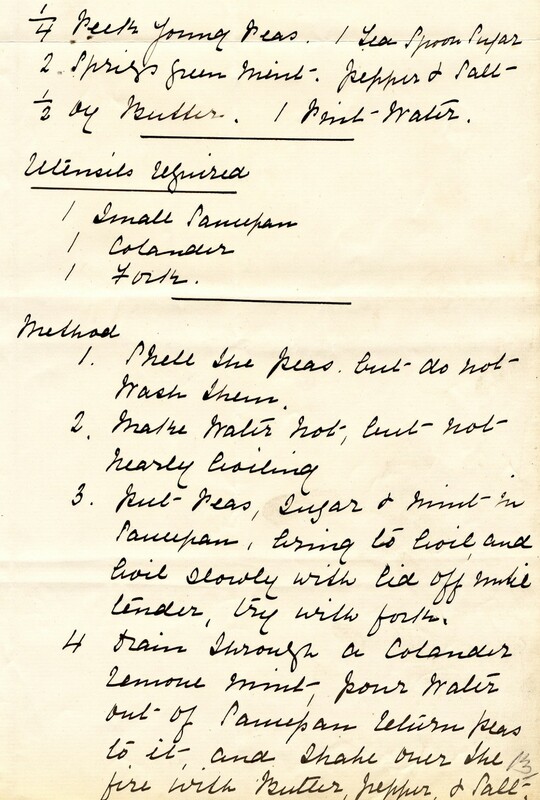 This recipe is for fresh peas and includes shelling one quarter of a peck of young peas then cooking them with sugar and mint. The peas are then strained and shaken "over the fire with butter, pepper and salt". NRS 3830 [20/12065 Bundle B]. 3. 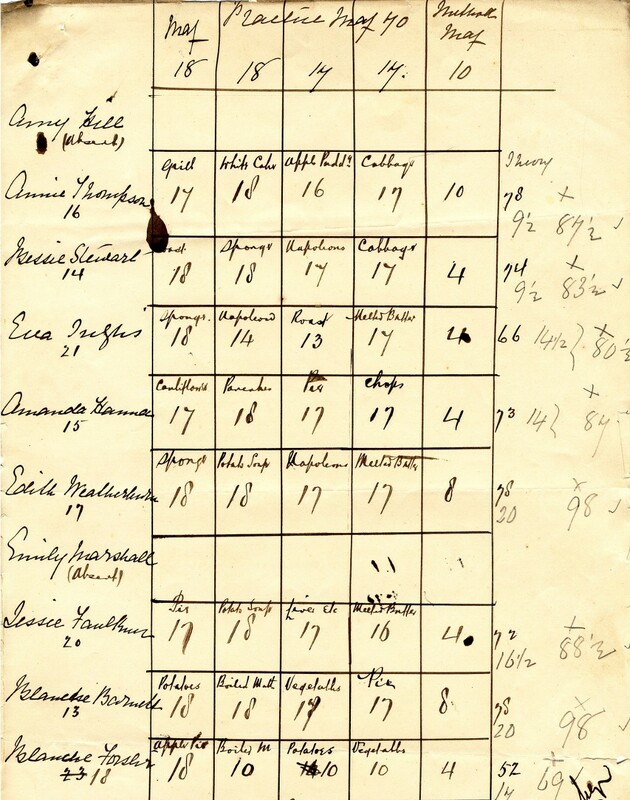 This is one page of several that shows the examination results for practical work and theory for a number of students from Blackfriars and Fort Street Public Schools in 1891. 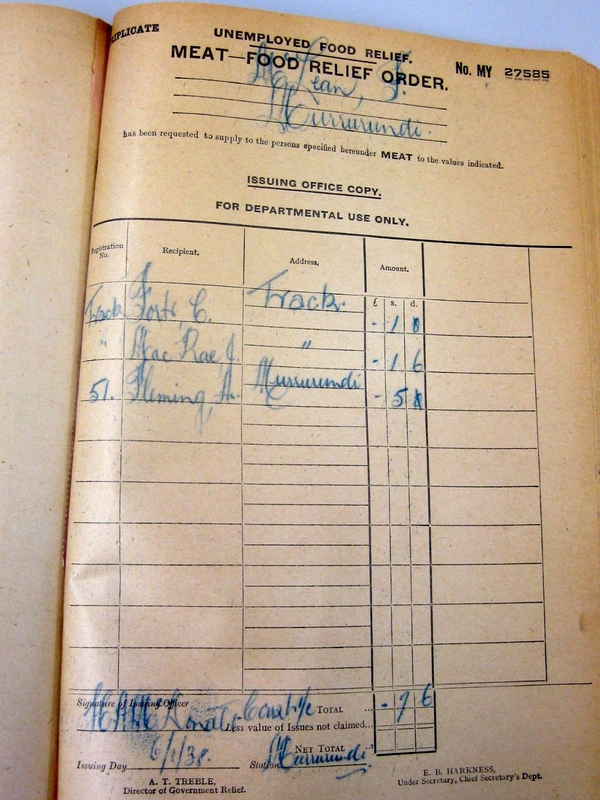 A number of hand written exam papers have also survived. Eva Inglis (#21) was from Blackfriars and she received a final result of 80.5 (66 in the practical and 14.5 in the written exam) which gave her a first grade pass. NRS 3830 [20/12605 Bundle B]. 4. 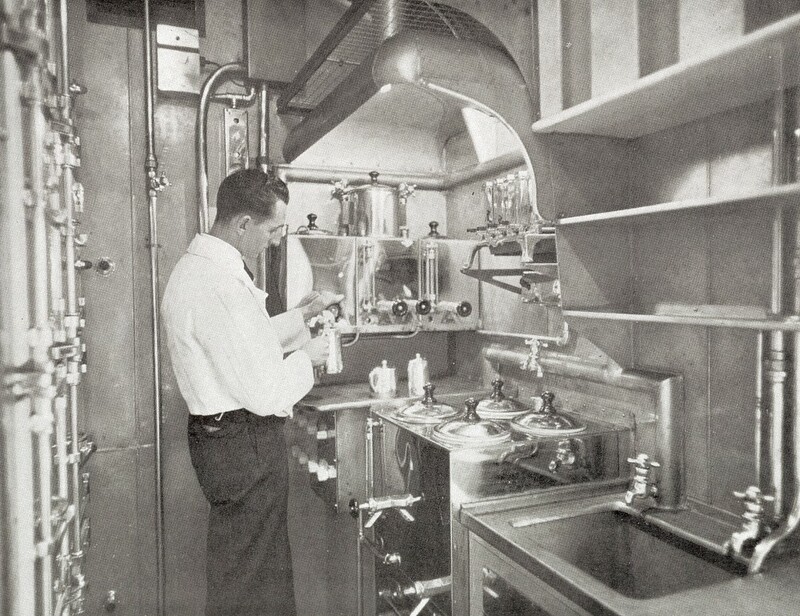 Can you imagine cooking on this? 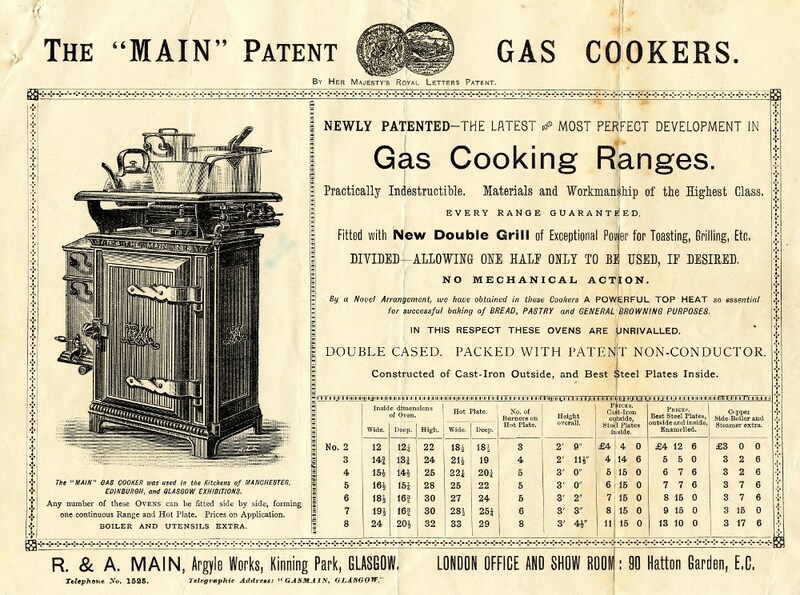 This detailed ad for gas cooking ranges includes a range, hot plate and new double grill. 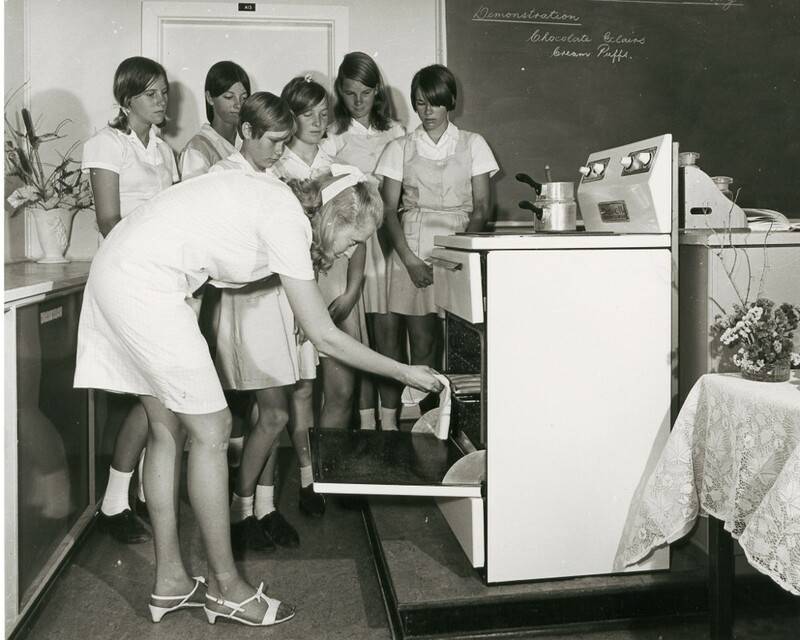 The ad was included with correpsondence about possbile new gas ranges for the cookery classes in schools. NRS 3830 [20/12605 Bundle 2]. 1. 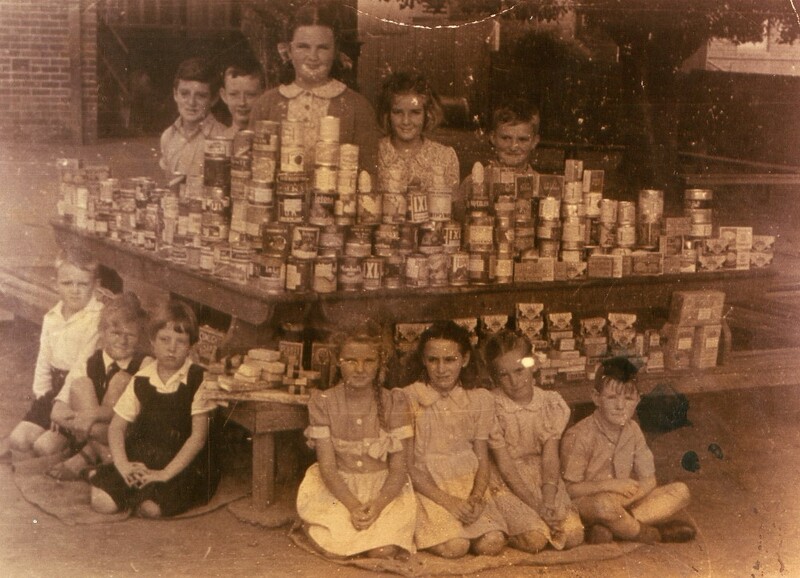 This photo, taken around 1946, shows a collection of canned good and other items that were probably collected to be sent to Britain as part of the "Food for Britain Scheme". 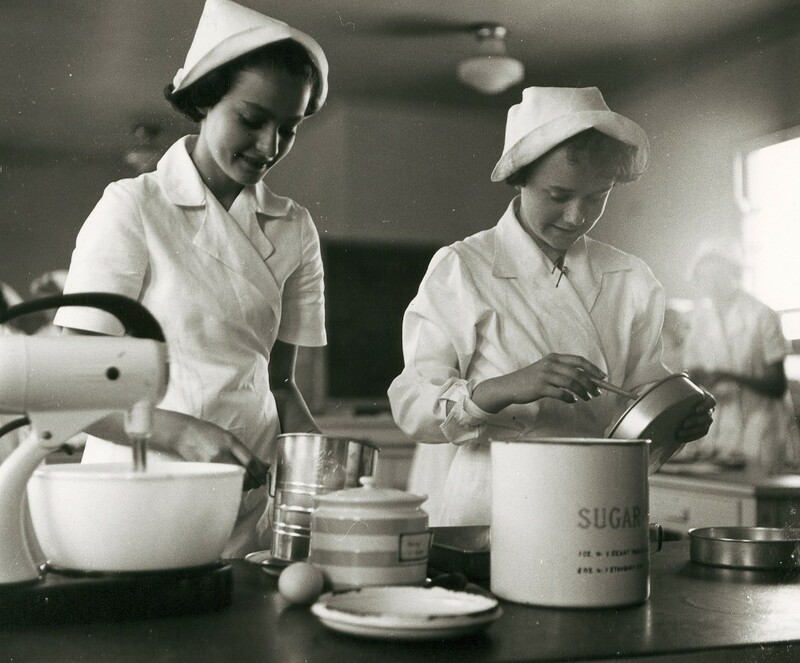 Even though World War II had ended in 1945 Britain still endured rationing up until 1954. 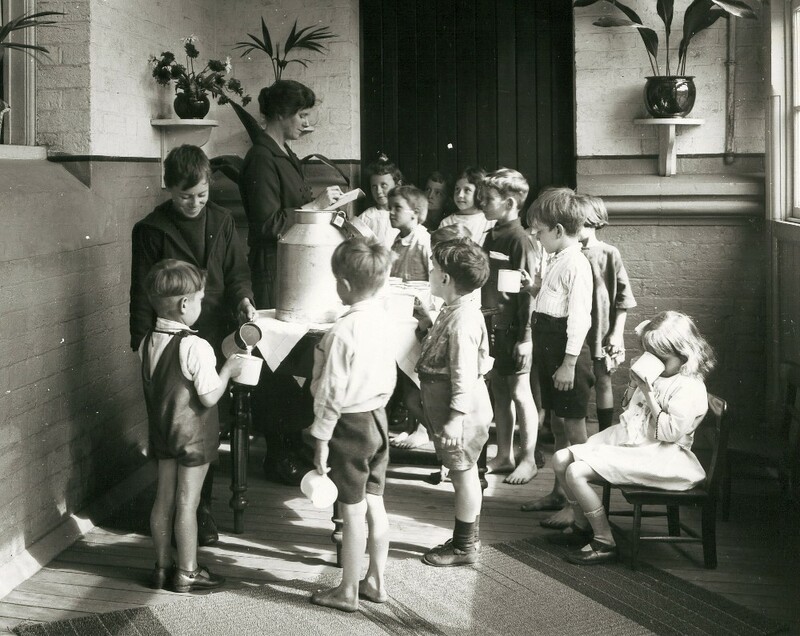 Many Australians with friends and relatives in Britain starting sending food parcels which required custom labels and stamps. NRS 15051/14 Castle Hill Public School. 2. 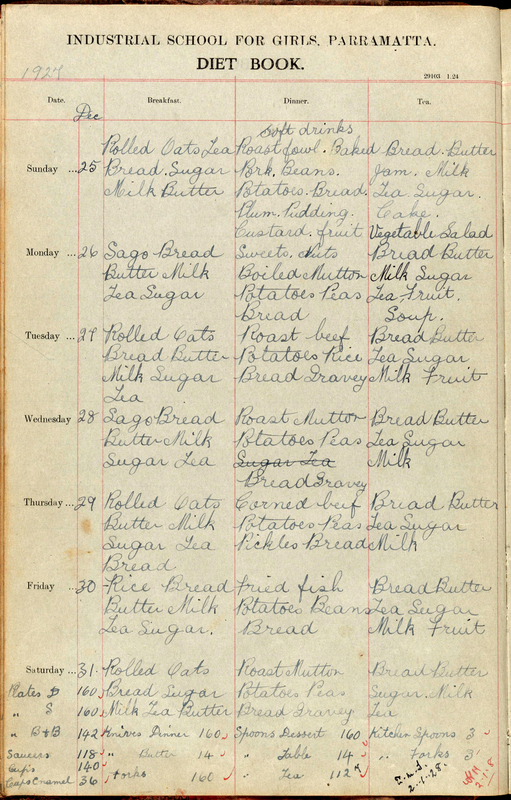 This page outlines the menu for a week at the Girl's Training Home at Parramatta. It includes Christmas Day at the top of the page and there are special treats like soft drinks, plum pudding, custard and cake included. 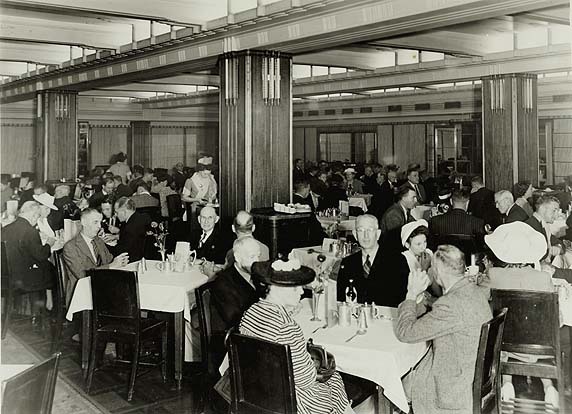 The rest of the week contains a fairly standard menu that is repeated without variety for a number of years: Monday bolied mutton; Tuesday roast beef; Wednesday roast mutton; Thursday corned beef; Friday fish. 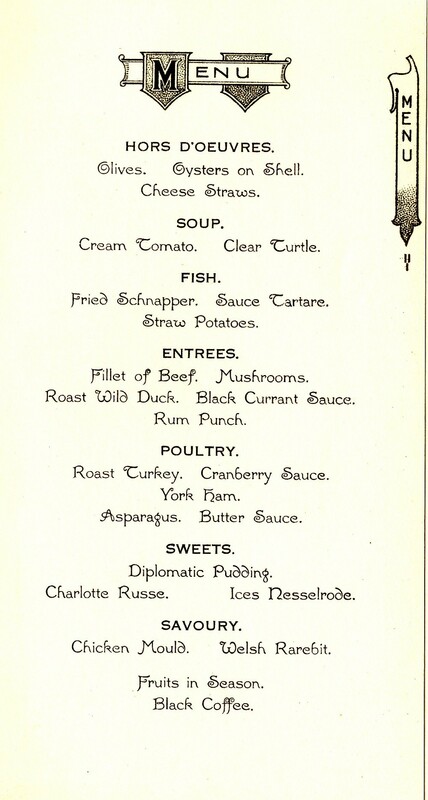 The menu also lacks much variety in the vegetables and fruit available to the girls. NRS 14743 [5/3425]. 1-2. 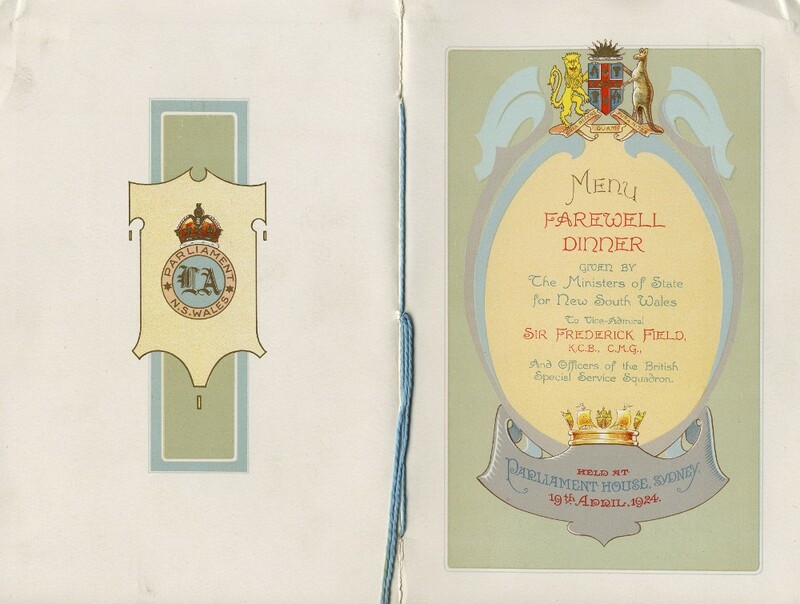 Luncheon menu for the opening of Federal Parliament, 1901. This French inspired menu starts with oysters, then consomme (with savoury egg custard cut into shapes), followed by fish, roast duck, beef, roast turkey, ham and asparagas. An entremets is a side dish, this one is comprised of desserts: Charlotte Russe (a moulded bavarian cream and sponge cake), Champagne jelly and Glace a la Nesselrode (iced pudding with glace fruit). The luncheon was finished with dessert and coffee. NRS 4473 [X719].